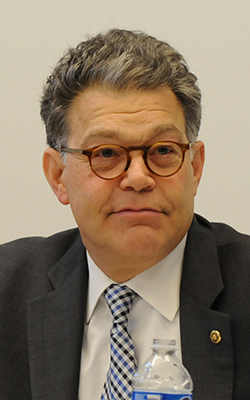 Al Franken is a senator for the great state of Minnesota. Net Neutrality is something he’s fighting for and you should be, too. Al’s married (Hi, Franni!). They have offspring (as opposed to The Offspring). He’s an Emmy-Award winning comedian having spent 37 years as a “comedy writer, author, and radio talk show host and has taken part in seven USO tours, visiting our troops overseas in Germany, Bosnia, Kosovo, and Uzbekistan – as well as visiting Iraq, Afghanistan, and Kuwait four times.”¹ He’s funny. And he’s got a mouth on him that makes me proud (at least of the issues we agree upon). And he’s got a knack for amusing and catchy book titles, such as Lies & the Lying Liars Who Tell Them, I’m Good Enough, I’m Smart Enough, & Doggone It, People Like Me!, and Rush Limbaugh Is A Big Fat Idiot. A Harvard grad. A Mover and a Shaker. And, he was Stuart Smalley. But back to serious issues. Minnesota Senator Al Franken. Photo credit: James Nord of MinnPost. Insurance reform. He “successful fought for a provision included in the health care reform law that makes insurance companies put 80 to 85 percent of premiums toward actual health services, not administrative costs, marketing campaign, or profits. His legislation, based on existing Minnesota law, represents the largest insurance industry reform in the health care reform bill. Veterans’ Rights. “The first piece of legislation he introduced – and passed – established a study that is currently pairing service dogs with veterans who have physical or mental wounds. He has helped a number of Minnesotans get the military medals they earned, but never received, including a World War II veteran from Duluth who was owed seven service medals for his service in Europe. [OK, this bullet point – minus this bracketed commentary – is word for word from the U.S. Senate’s website, because WTF Armed Forces? These people aren’t getting their medals after they went off to be killed (and kill) for the United States? That’s grotesque. Get on it. This isn’t the first time I’ve been saddened by stories about veterans not getting what comes to them, such as appropriate health and psychological care … *E-HEM! * →] He also successfully fought to get the Department of Veterans Affairs to provide benefits for conditions resulting from exposure to Agent Orange [WHY, I ask, must any of us fight for veterans to get their due benefits?! And have any of you, Good Friends, ever visited a veterans’ hospital? If not, take a gander at one and get appropriately pissed off]. and plain ol’ funny commentary. Yes, he has made me chuckle in the past. As you surely know, Congressperson Franken and I are tight. And he sent me this message that I’ve felt I should in turn pass along to my readership regarding the Internet (aka “The Interweb”) and the greedy ability of some to, among other things, slow down the websites of other domains to assure their own continued massive wealth. Net neutrality is in deep trouble. If you’re new to this fight: Net neutrality is the principle that all websites should be treated the same by Internet providers and not given a leg up for any reason. The website of a mom-and-pop small business shouldn’t load any slower than the website of their multi-national conglomerate competitor. But a federal court just stopped net neutrality rules from going into effect, opening the door for the big telecom corporations to give their preferred content an unfair advantage. We need to fight back — click here to sign my petition in support of net neutrality. Without net neutrality, these big telecom corporations could become gatekeepers to the Internet. Small businesses could face an even more uneven playing field than they already do. 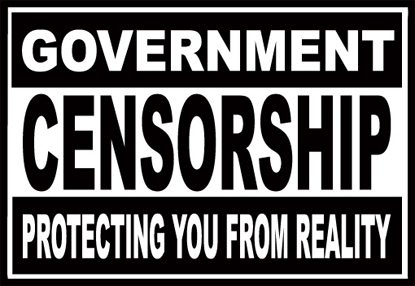 Independent content could become harder and harder to find online. And you could wind up paying more to access the sites you want to surf. Big companies like Verizon, Comcast, and Time Warner shouldn’t get to decide who can use the fast lane on the information superhighway — which, after all, was developed at taxpayer expense and has been open to us all by design. But if this court ruling is the final word, there will be nothing to stop Internet providers from violating net neutrality. Let’s make sure that doesn’t happen — click here to sign on in support of net neutrality! I talk to Minnesotans every day who are sick of paying more for less when it comes to broadband Internet. And I don’t want to see that trend continue. That’s why I’ve been proud to lead the fight in support of net neutrality. But now, with this court ruling dealing us a huge setback, I need you with me in that fight more than ever. Click here to say you support net neutrality and let’s organize to make sure we protect it. P.S. : If net neutrality is destroyed, telecom companies could even make it harder to access content that challenges their control of the Internet — a good reason to sign our petition!